This ultra-thin screen cover not only protects your iPad mini's screen and acts as a stand, but also doubles as a Bluetooth wireless keyboard so you can enjoy a comfortable typing experience without detracting from iPad mini's thin, light and cool style. Simply slide your iPad mini into the recessed groove behind the keyboard to hold your device at the ideal angle for both typing and interacting with the touch screen. The protective screen cover is secured by powerful integrated magnets and features automatic wake/sleep functionality to preserve battery life. The EasyType keys offer a traditional typing layout in a small form factor plus iPad mini function shortcut keys for the commands you use most often, such as copy, paste and more. Ultra-thin aluminum design weighs just 208 grams, almost 1/3 less than the iPad mini. 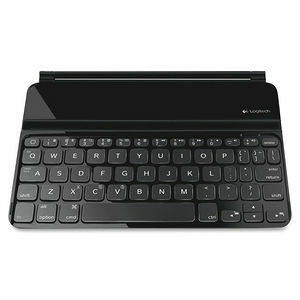 Charge the Ultrathin Keyboard Cover Mini using the included USB cable. Get up to six months of battery life on a full charge.